Review Travel speakers come in all shapes and sizes and, to be frank, the majority are pretty horrid, both from an audio and design perspective. However every so often something comes along that piques our interest here at Vulture Central. X-MI's Mini II was one such device and the Livespeakr [sic] from US start-up Digital Group Audio is another. Unlike X-MI's offering, the Livespeakr is aimed squarely at the iPhone and iPod user. 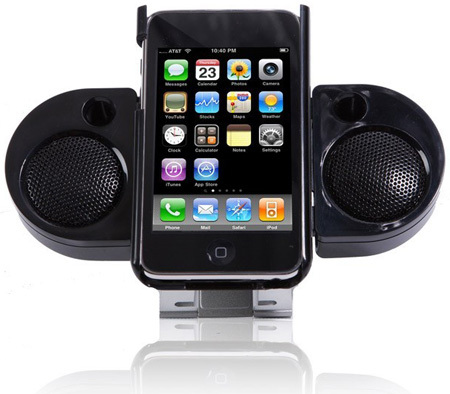 The idea being that it provides a compact, light, self-powered speaker array that also holds your iPhone or iPod Touch in the right orientation for either watching videos or listening to music. Being fully iPhone compliant and shielded against radio interference, it also doubles up as a speakerphone. That's the theory, so how does it work in practice? The fundamental design of the Livespeakr is nothing, if not unique. 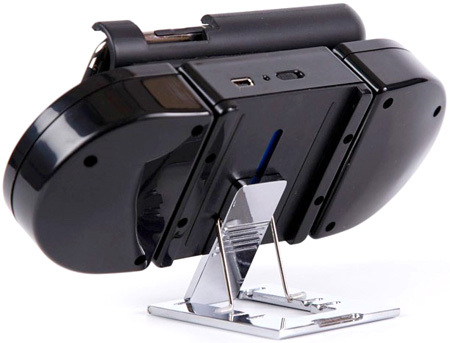 A plastic cradle into which you can slide or clip your iPod or iPhone attaches to a central unit by four slider pegs, while two speakers are attached to the central unit via retractable sponsons. Turn the mounting cradle 45 degrees to the left from vertical and the speakers extend by 25mm, meaning they sit flush to the sides – or ends, depending on how you look at things – of your iPod, whether it is in a portrait or landscape position. The central unit itself is mounted on a 20mm tall extendable metal stand that cants the whole contraption back by about 45 degrees, making it ideal for watching videos on your desk. The stand is not only very sturdy but also comes with rubber contact patches for a secure grip, so you can control your iPhone or Pod with one digit without fear of it falling over. Of course, that's just as well since the Livespeakr is devoid of controls – beyond an on/off switch and a miniUSB charging port – so all navigation has to be executed directly with your iPod or iPhone. If you prefer to use both hands, the cradle holds your iWhatever securely enough to allow you to pick the entire assembly without fear of everything coming adrift and heading towards the floor for a messy and expensive impact. With the speakers 'closed' and stand folded away the device measures 160x22x60mm and weighs around 100g so packing it shouldn't be an issue for even the lightest of travellers. Remove the cradle from the main unit and the audio cable that connects the player's 3.5mm headphones jack to the Livespeakr can be re-routed to either the left or right – or top or bottom – to allow for the connection of both iPhones and iPods, which have their audio jacks at different ends, without reams of loose cable festooning the device.